A black and white negative of the swimming pool at Inverlynn house in Whitby. 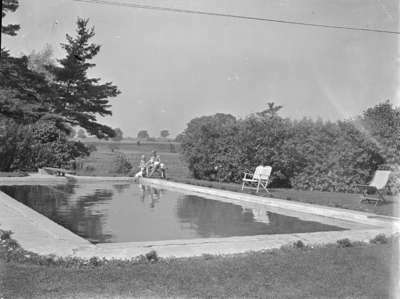 Two young children sit by the pool with their dogs. Swimming Pool at Inverlynn, 1946, Marjorie Ruddy. Whitby Archives A2013_040_1247.